WASHINGTON (CNS) — The chairman of the U.S. bishops’ Committee on Pro-Life Activities praised lawmakers for including two conscience provisions in the House version of the 2013 appropriations bill for the federal departments of Labor and Health and Human Services. “Our government has a long history of respecting rights of conscience in health care, and the time is long overdue to reaffirm this laudable tradition in the face of today’s growing threats,” Cardinal Daniel N. DiNardo of Galveston-Houston said in a July 17 letter to members of the House Subcommittee on Labor/HHS. The other provision is the Respect for Right of Conscience Act, which Cardinal DiNardo said would “counter a policy that poses the most direct federal threat to religious freedom in recent memory,” a reference to the “HHS mandate” requiring most religious organizations to include sterilizations and contraceptive coverage — including those that could cause early abortions — in their employee health care plans. The subcommittee was preparing to mark up the appropriations bill for eventual action by the House Appropriations Committee and then the full House. The Senate Appropriations Committee had done its own markup, first in subcommittee and then in full committee, June 12 and 14. “The endgame for a final appropriations bill is unknown at this time, but agreement between the two houses of Congress is likely to be late fall or early winter at the earliest,” said a June 18 statement from Directors of Health Promotion and Education, a trade group. 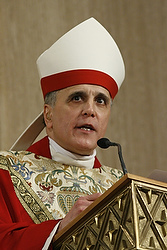 In his July 17 letter, Cardinal DiNardo said inclusion of the Abortion Non-Discrimination Act “will provide urgently needed relief” by codifying the Hyde-Weldon amendment, which has been part of Labor-HHS appropriations packages since 2004, and will enhance “its enforceability” by closing loopholes and providing victims of discrimination with a “private right of action” to defend their rights in court. Currently, Hyde-Weldon “can only be enforced by lodging a complaint with the Department of Health and Human Services, which in recent years has given a low priority to such claims and sometimes has itself been the perpetrator of discrimination,” Cardinal DiNardo said.